Yep, the Frogs are bringing us another installment in The Lost Lands campaign setting, and this is a huge one. The Northlands Saga Complete has been touched on with the Northlands Saga series of releases back in 2010 and 2011, but now it goes to 11. Or 20 if playing Pathfinder. The book is estimated to come in at 800 to 900 pages and I'm assuming that is the Pathfinder page count. Swords & Wizardry will probably be about 75 to 80% of that count - still a huge book if you ask me. Now The Northlands Saga Complete updates and expands those original adventures with new material, completing the saga with six more adventures by Ken Spencer, Greg Vaughan, and Kevin Wright that follow directly after the originals. If you want, you can resume campaigns that “ended” after the last adventure was released in 2011, or start fresh. In addition, an eleventh new adventure is added as a “prequel” to the original four, so you can play an entire adventure path to take PCs from level 1 to 20 (about level 1 to 9 in the Swords & Wizardry version). You can play any or all of the eleven adventures as standalone sessions, or you can use them as a single continuous campaign to explore the Northlands and beyond. And as a bonus, authors Ed Greenwood, Ken Spencer, Kevin Wright, and Jeff Provine have committed to write four more adventures as stretch goals to take your campaign beyond the adventure path. This book has an estimated page count of 800-900 pages (this will vary depending on the number of stretch goals reached), and will be library bound, for years of use. 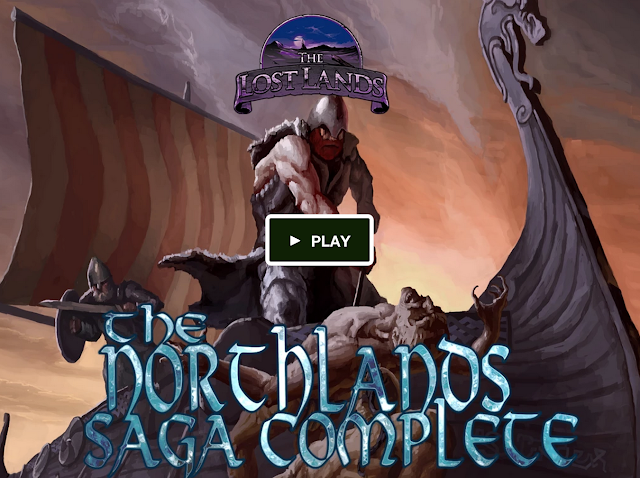 As a part of the Lost Lands campaign world, The Northlands Saga Complete includes a full-color poster map as well as a complete campaign guide detailing the cultures, history, races, nations, languages, geography, new monsters, magic, and equipment unique to those lands. In the Pathfinder version there is also a chapter dedicated to new optional rules that you can use in your game to capture the authentic spirit of the Northlands with rules for things like a character’s wyrd, death speeches, becoming a jarl, the examples of early representative politics in the Things and Althing, and trial by combat in the holmgang. In addition there are a multitude of new archetypes, feats, player-character races, and character traits for use in your Pathfinder game! (emphasis mine) When you delve into The Northlands Saga Complete, you step into the living, breathing world of the Northlands. Actually, maybe change the page count for the Swords & Wizardry version to 65% or so of the Pathfinder version. I guess the PF page bloat is paid for by the higher print run, as the Pathfinder / Swords & Wizardry pledges are running about 3 to 1 right now. This book looks amazing! It is chock full of adventures, but is also a setting book. I don't think we've seen anything like this from FGG since Slumbering Tsar. Usually the S&W page count is about 75% of the Pathfinder page count. I'm not finished with the conversion yet, so I can't nail it down precisely, but at the moment it seems on track for that. We're going through two S&W conversion passes on most of this book instead of just one, so it's a longer process but I think the result will be worth it.